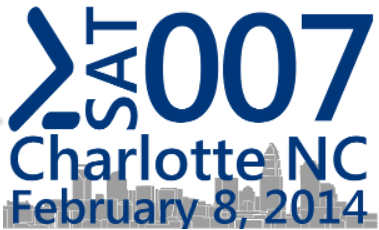 Note PowerShell Saturday #007 will be held in Charlotte, North Carolina on February 8, 2014. This will be an awesome chance to meet and to learn from some of the best PowerShellers around. In fact, five of the speakers are also speakers at the PowerShell Summit this year. There are a limited number of tickets still available for this event, so you’ll want to sign up now. The Scripting Wife wrote a great post that provides a quick overview of the event: Psst…Charlotte PowerShell Saturday Details Leaked. One of the cool things about Windows PowerShell, since version 1.0, is that it provides easier access to WMI information. The bad thing, of course, is that it is still wrestling with WMI, which some IT pros seem to hate (or at least dislike). The great thing about using raw WMI is that it provides compatibility with older versions of the operating system. For example, using raw WMI and Windows PowerShell would make it possible to talk to Windows XP, Windows 2003 Server, Windows 2008 Server, Windows Vista, Windows Server 2008 R2, and Windows 7, in addition to the modern operating systems of Windows 8.1, Windows 8, Windows Server 2012 R2, and Windows Server 2012. Get-WmiObject -Class Win32_NetworkAdapterConfiguration -filter "IPEnabled = $true"
The problem with this methodology these days is that some of the pseudo adapters are also IP enabled. The previous command would eliminate many, but not necessarily all, of the adapters. 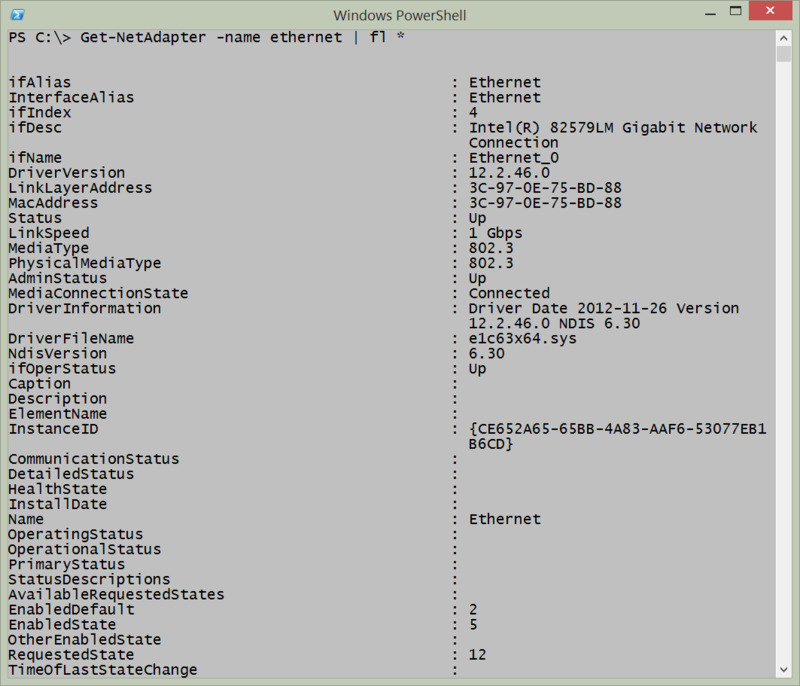 A better approach is to look at the Win32_NetworkAdapter class and query the NetConnectionStatus property. By using this technique, I return only network adapter devices that are actually connected to a network. Although it is possible that a pseudo adapter could sneak in under the wire, the likelihood is more remote. In this command, I will use the Get-WmiObject Windows PowerShell cmdlet to return all instances of Win32_NetworkAdapter class on the computer. I then create a table to display the data returned by the NetConnectionStatus property. There are two things you will no doubt notice. 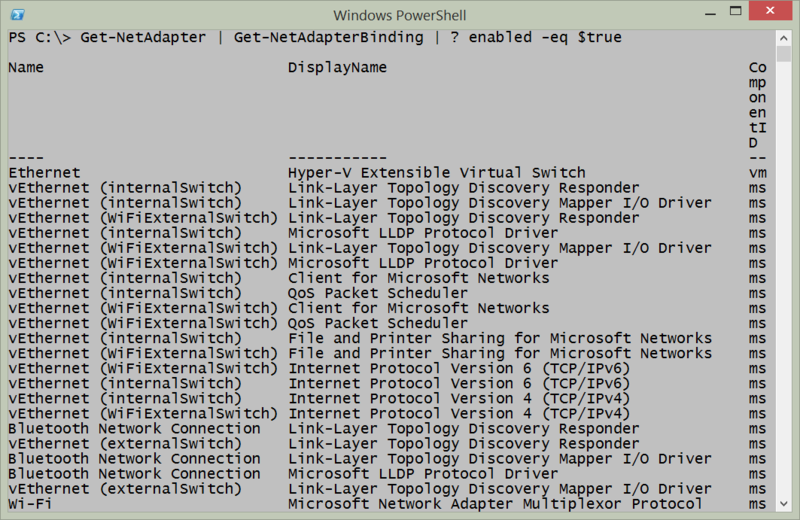 The first is that most of the network adapters report no status what-so-ever. The second thing you will notice is that the ones that do report a status do so in some kind of code. The previous table is therefore pretty much useless! But it does look nice. The value of 2 means the network adapter is connected. Here is the command I wrote to exploit the results of our research. Such ecstasy is short lived, however, when I realize that although I have indeed returned information about a network adapter that is connected, I do not have any of the configuration information from the card. What I need is to be able to use the NetConnectionStatus property from Win32_NetworkAdapter and to obtain the TCP/IP configuration information from the Win32_NetworkAdapterConfiguration WMI class. This sounds like a job for an association class. Write-Host -ForegroundColor cyan "Network adapter settings on $computer"
I begin the script by using a command-line parameter to allow us to run the script remotely, if needed. I use the Param statement to do this. I also create a function named funline that is used to underline the results of the query. It makes the output nicer if there is a large amount of data returned. I print out the name of the computer by using the Write-Host cmdlet as shown here. I use the color cyan so the text will show up nicely on the screen…unless of course your background is also cyan. Then the output will be written in invisible ink. That might also be cool. Then I get down to actual WMI query. To do this, I use the Get-WmiObject cmdlet. I use the –computername parameter to allow the script to run against other computers, and I pipe the results to the ForEach-Object cmdlet. I need a way to look at the netConnectionStatus property of the Win32_NetworkAdapter class. This class is referred to by the reference returned from the association query. It is called element. To gain access to this class, I use the reference that was returned and feed it to the [WMI] type accelerator (it likes to receive a path, and this is what the reference is). Now, because NetSh is an old style menu type application, it is possible to enter NetSh, and walk my way down through the menus until I arrive at the proper location. Along the way, if I get lost, I can use the ? to obtain Help. The command and output associated with the command are shown in the image that follows. PS C:\> Get-NetAdapter | where adminstatus -eq "up"
Get-NetAdapter | where adminstatus -eq "down"
Join me tomorrow when I will continue Network Adapter Week by talking about enabling and disabling network adapters.